This cute youth synthetic horse saddle is perfect for trails and fun shows with a pink trim and silver etched corner plates on the skirt! 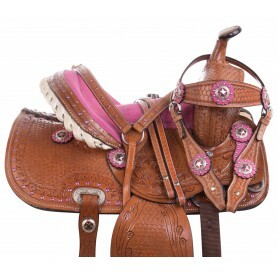 The saddle comes complete with a matching tack set and saddle pad for only $179.99 while supplies last! Was $399.99 Now $179.99 For A Limited Time Only! This lightweight kids seat horse saddle is perfect for trail riding, schooling, or even for fun shows! 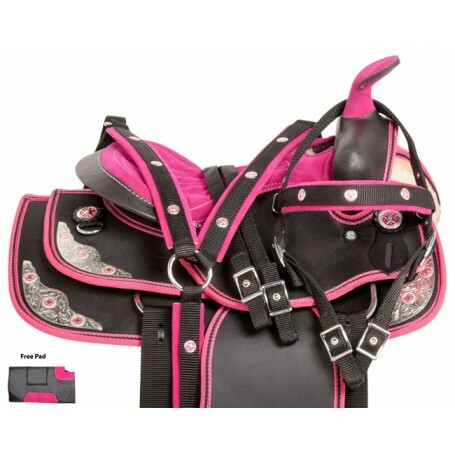 The black synthetic material is outlined in a bright pink binding that help ensure the saddle stays tear proof. The fuchsia pink suede seat is well-padded and offers stability and comfort for the rider. Silver etched plates on the corners adds eye catching detail and brings out the silver Texas star conchos on the saddle. 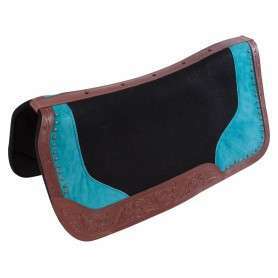 The underside is well-padded with synthetic fleece for your horse comfort. For a limited time only, receive a FREE matching headstall, reins, breast collar, and saddle pad while supplies last! Cinches not included.